Rahul Dravid, the former India batsman, has been listed, among 24 others, for the Padma Bhushan award, India's third highest civilian honour. 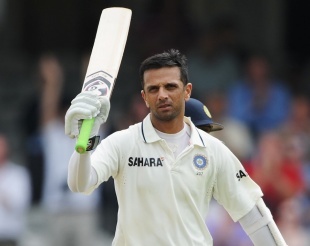 Now a television analyst, commentator and columnist for ESPNcricinfo, Dravid announced his retirement from international cricket last year, having scored 13,288 runs in Tests and 10,889 runs in ODIs during a 15-year career. He is the only cricketer in the list of Padma Bhushan awardees. Indian boxer Mary Kom being the other sportsperson to be short-listed for the honour. Dravid, who shouldered a large portion of India's batting burden during their period of strength at home and abroad in the past decade, was nominated for the Khel Ratna, India's highest honour in sports, six months ago. He won the Arjuna Award in 1998 and was given the Padma Shri in 2004. He joins nine other cricketers, including Kapil Dev, Sunil Gavaskar Vinoo Mankad and Lala Amarnath, to have had received the Padma Bhushan. Sachin Tendulkar is the only cricketer to have be awarded with the Padma Vibhushan, India's second highest civilian honour.